The first maintenance free water edging. 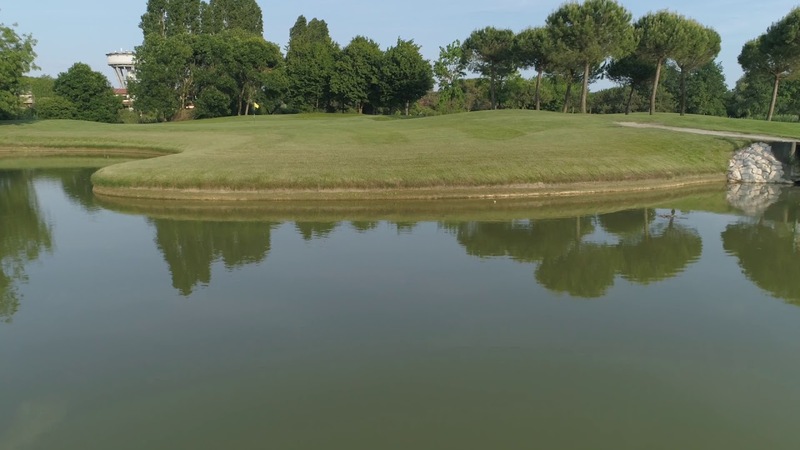 Anyone responsible for maintaining water features on golf courses, or in parks or gardens, will often experience difficulty maintaining a ‘soft’ interface between water and landscaping. There are some instances where it is desirable to maintain a natural water margin. They can be important ecological habitats, and unmanaged these shallow areas support emergent vegetation, which in turn provides cover for threatened species such as amphibians and water voles. However, when these areas impinge close to areas of play on golf courses, problems arise. Banks can erode and adjacent high footfall areas can become slippery and dangerous for golfers and maintenance staff. Furthermore, access is difficult for maintenance, and as a result these areas often become muddy and unsightly. There’s also the rules issue. It can often be difficult to determine what is in or out of a hazard. Contentious golfing rulings often result in dozens of red and yellow stakes, which in our opinion are very unattractive. Provides a stable edge to water margins, reducing risk of vehicles, maintenance staff or golfers slipping or sliding into the water. Very little maintenance required in comparison with many other edge details. It is very difficult to maintain pristine edges to water features. Aquaedge not only makes beautiful and elaborate edges possible; It makes them easy and natural looking. By comparison with traditional methods, installation requires much lighter construction plant, reducing potential damage to the golf course and saving money. Installation is much quicker than all traditional lake edging construction options. The debate of whether a ball is in or out of a hazard becomes a thing of the past. The margin of the hazard is accurately defined, and all those ugly yellow and red stakes can be dispensed with. As many engaged in golf course maintenance will know, the margin where water meets grass is also a problem. Our response is AquaEdge – a ‘buffer’ which is also a retaining wall comprised of horizontal layers of sand filled synthetic grass. The engineering factors and constraints of water margins are complex. Things to consider include foundation design, hydraulic loading, flow velocity, erosion potential, imposed loads, construction and environmental hazards, and health and safety issues. AquaEdge is a civil engineering process which includes an initial investigation, design and specification work, planning, the supply of the various components and installation.